The jutting height and near-perfect straightness of Comb Ridge defies the landscape of southeastern Utah. One side of the ridge faces each day’s sunset with 80-miles of sheer cliffs. The other side is a wide, steep ramp carved into convoluted sandstone side canyons that quickly shed any rain that falls from the broad sky. Hidden on the ridge is a mystical story-telling petroglyph that we intend to find. Departing just before dawn, journalist and hiking partner Nina Rehfeld and I leave the small Mormon settlement of Bluff, Utah, headed west. We are working together on a travel magazine story about the Anasazi, and the night before we had chatted with innkeeper Jim Hook at the Recapture Lodge. I had asked about a particularly intriguing panel of rock art that I heard was tucked up in the cliffs of the ridge. Jim took his time getting to know us, but then scratched a few quick notes in blue ink onto a Google Earth image as he explained the route. Cameras on a satellite cruising through the darkness of space had captured the broad wash paralleling Comb Ridge, and a meandering thin line following beside both. He marked the turnoff from Highway 163 between Bluff and Mexican Hat, and then indicated the spot to park far down the thin line of a dirt road beside Butler Wash.
As we drove a shimmer of first light began to melt over the distant cliffs. The edges of Black Mesa, a wide landform in the distance, caught the warm light in striking contrast to the shadowy sage plain. On the horizon, ghostly Abajo Mountain shown with an iridescence of color. In the 4-WD Jeep Cherokee we bounced along beside Butler Wash and the tilting maze of Comb Ridge, cottonwood trees outlining pathways of underground water. Only seasonal runoff fills the deep-cut wash, which then eventually empties into the San Juan River to the south. The wash continually separates us from the flanks of the ridge. This day it will be dry as a bone. No rain has fallen in weeks. Moisture is always the call and response of this stark landscape. Ancient societies moved across the mesas and through the canyons following the call of rain, and its gift of supporting life. When the sky withheld rain the people responded. They packed up and moved to new territories. On their backs they then carried the hope that somewhere else would give more abundant harvests. The rock art echoed this story. Nina and I watched with awe as the crest of Comb Ridge first held a soft, warm glow across its cream-colored sandstone. Shadows fell into its folds and ravines. The full moon hovered weightless in the pale blue light above the ridgeline. For a short while, the light has a purely magical presence. The barren sandstone exhales color as tender as a baby’s breath. The soft light lingers over the sage plain, then the color fades so slowly that the mind feels deceived when the eyes realize the colors have evaporated. The moon drops behind the ridge, a quiet reminder of the mysterious cosmos, hidden away until nightfall. The satellite photo showed the road tracing alongside the dry wash with dark scribbles of cottonwood trees braiding the way. The lines danced together and apart until, at a sharp bend, the road pulled away and crossed a tributary wash. This helped us pinpoint the beginning of the hiking route, which Jim had marked as 6.8 miles from the highway. We scan the topography. Reading a landscape is much like using a second language. The view of our aerial photo must be carefully translated into the foreshortened view at ground level. 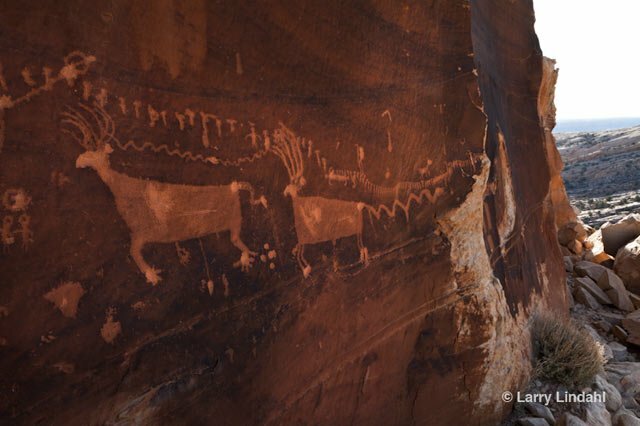 And so, we begin our hunt for this distinguished rock art site called the Procession Panel. Jim had sketched a dashed line that follows the snaking edges of a shadowy side canyon hidden high among vast and incongruous cliffs and canyons. His one-inch line is a fraction of the scale of the mile and a half route to the site. There, nearly at the top of Comb Ridge, we hope to find the large petroglyph panel with a row of human figures stretching nearly fifteen feet long. He said the route would be marked with cairns, but these temporary rock stacks can easily be misleading. Quite simply, too many people build their own markers in this land of smooth stone referred to as slickrock. Since the dawn of humanity, people have walked the land following natural passageways through the complexities of the terrain. The effort of route finding is refined over time. Individual tracks become trails and the land slowly becomes inscribed with the calligraphy of travel. Before we have gone too far, Nina and I mentally mark a feature of the landscape to find the vehicle again. There among an endless parade of trees in the wash, we find one tree canopied with orange-brown leaves, it becomes our landmark. The steepness of Comb Ridge soon bears down on us as we ascend, enfolded among gullies and rising cliffs. We compare our progress to the shading of our aerial map, and guess at our location among lichen painted rock and scrubby plants anchored to cracks in a sea of rolling sandstone. Hunting for comparisons to our satellite image we search out a particularly huge rock formation. The photomap shows an oblong area with no texture, just an empty space of white paper resembling an enormous beached whale. Hiking below two similar looking formations we climb higher and higher. My back is hot, and damp, under my pack. The slickrock hangs diagonally across a steep slope, and over to the right are scattered and broken slabs mixed among juniper trees, old and gnarled. We ascend the final stretch toward the top of the ridge hoping we are still on the route. People have passed this way, not only in ancient times, but now, and cutting through a sandy, shallow valley leading up to the ridge, we find a narrow footpath. With a new perspective higher up the ridge, we see a broad expanse of dark-stained sandstone, a likely place for the story-telling gallery of petroglyphs. Finally, angling toward the deep shadows beneath the whale rock, the distant petroglyphs begin whispering for our attention. One final challenge divided us from our destination, a tangle of huge, broken boulders and sandstone slabs tilting against gravity. Silently waiting in the desert varnish was the long line of human figures, one after another ascending the pass, just as we had done. A few precisely carved figures held tall hooked staffs, standing taller than the others. Prominent among the row of humans trotted two, large blocky animals, detailed with antlers, and hooves. On a closer look, many figures had relatively fresh-pecked pockmarks in their hooves and thin lines radiating upward like invisible magic. The newer dots and lines contrasted brighter across the glyphs dulled by age. The figures had been reenergized, not defaced. The procession of ancient travelers continued up the hill across the dark desert varnish, to a large circle inscribed on the mineral stained sandstone. Dashed lines descended below the empty circle. Some figures continued on straight beyond the circle. The intention of the circle is strong, but we can only guess at its deeper meaning, the exact message lost to the winds. Yet, its obvious, these people are on the move. From a distance I hear, “Its beautiful from up here!” Nina had spent time with the petroglyphs, but was now standing on the crest of the ridge. I shout back that I’m on my way. I finish photographing the petroglyphs, then forge my way up the rocky gully to join her. At the top, I gaze out on the vista, the horizon pale, and very far. The pull of gravity tugs at me uncomfortably. I turn to walk along the precarious drop to investigate the rounded sandstone shoulder that falls appallingly into a panoramic void. I traverse the ledge carefully and at the far end we discover Moki steps carved ages ago into the weathered old sandstone. The ancient pathway goes nearly straight down the cliff of Comb Ridge. The passageway has dangerously shallow pockets, only inches deep, badly worn over centuries of time. The long-ago migrations of people once braved these hand-cut stairs into a new land. Their fear tamed by courage, and a strong inner drive moved them further along, regardless of this overbearing obstacle. Down this cliff they would have proceeded, carrying the hope of a better life to the valley below and into the vast land beyond Comb Ridge. We don’t follow the ladder of stone steps; their weathered condition steals any bravado we could muster. I turn around, not knowing how it is to descend a perilous cliff to a new life. Only a short distance away, Nina finds a palm-sized potsherd, a broken piece of a large pot. We see more, smaller sherds, broken from bowls or jars, speckling the chalky soil. Further along I discover a mano, a hefty grinding stone. A human had carried it to this high place, but then discarded the tool once used for making corn flour. A kitchen of broken pieces now rested not far from the stairs over the cliff. These remnants, either too heavy or too fragile, speak of a things importance, what to keep of their belongings, and what to leave behind. The individual events of this ancient migration will forever lay untold. The people are gone, but the universal challenges, needs, and solutions for survival are still alive. Yet, their philosophers, deep thinkers, and collective legends, set them apart within our cosmos. Like an unfinished mystery, these household goods tell a human story played out above dangerous steps chiseled down a cliff. Nearby the ancient symbols of a reality that carries its own power, a story always echoing from the past, holds the space, perhaps the stilling of the moment, a pause before their great adventure to that place around the corner, known as the future.